If you have a moment, please stop by my facebook page to enter my holiday romance giveaway. 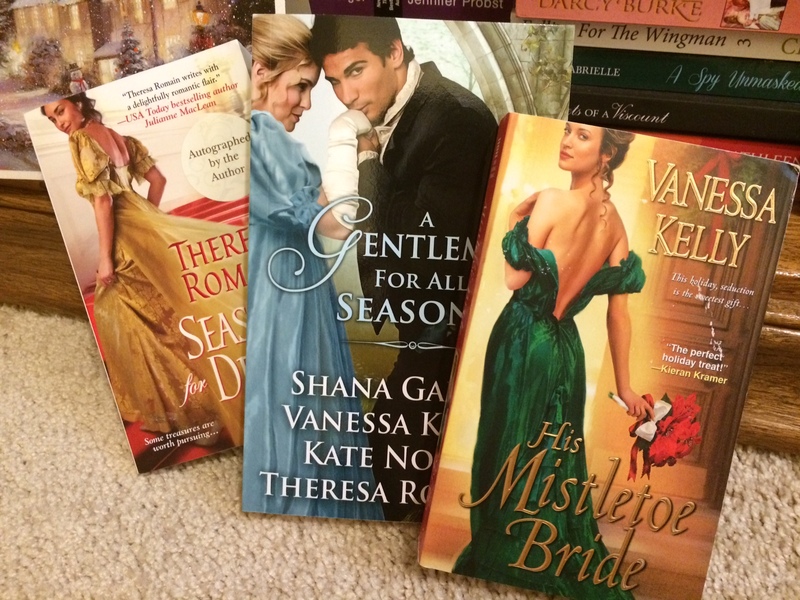 One winner will snag print copies of one of Theresa Romain’s lovely Christmas romances, plus a copy of my new anthology, A GENTLEMAN FOR ALL SEASONS. And I’m also including a copy of my Christmas Regency romance, HIS MISTLETOE BRIDE. Thank you, Dina! Happy holidays! The winner was announced on facebook yesterday, Geraldine. Thanks for stopping by! Merry Christmas and thanks for a chance to win books. I would love a chance to read them. Happy holidays Vanessa!! Thanks for the opportunity. You’re welcome, Jane – Happy Holidays! Love your books and waiting for the next one, Have read them all and they have given many hours of enjoyment. Thank yu for the chance to win. Have a Merry Christmas and a Happy and prosperous New Year. Norma, this makes my day – thank you! My next book, MY FAIR PRINCESS, will be out in August and is now up on Amazon & B & N. I’ll be posting more on my website soon! I wish you and yours a very Merry Christmas and a Happy New Year!